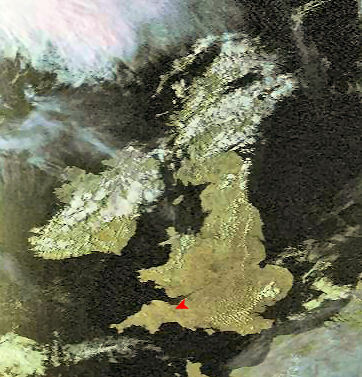 The satellite image on the left shows the location of Dunster in the UK. It is in the county of Somerset, on the edge of the Exmoor National Park. Dunster is indicated by the red arrowhead. The village is close to the town of Minehead, and is about a mile from the sea - it even has its own beach on the Bristol Channel. Dunster is situated on the A39 some 3 miles from Minehead and approximately 24 miles from both Brigwater and Taunton. There is regular train service to both these towns. There is also a frequent bus service from Taunton to Minehead. In addition there is link from Bishops Lydeard near Taunton via The West Somerset Steam Railway. The location of Dunster can be seen in more detail from Google Map Link here. 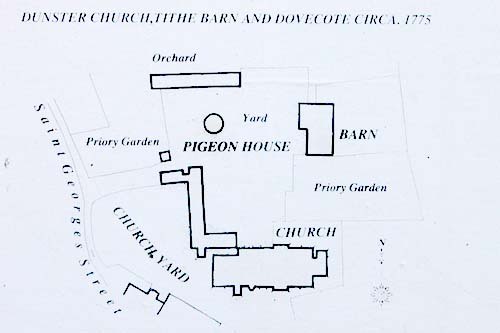 In contrast, the map below shows the village of Dunster in about 1775 showing the relative locations of the barn, church, dovecote, and priory.